Google Apps for Education, more commonly referred to as GAFE, are a host of products designed by Google for specific use in education. Many of the products you are probably already familiar with; things like gmail, Google Drive, Google Calendars, and YouTube are all part of GAFE. But in addition to all these well-known services, there are a multitude of add-ons that a teacher or administrator can add to their account to enhance the teaching and learning experience in your building. This is my second year at NETA and my first year presenting a breakout session. I presented this session in October at the Fall Neta conference, but I am looking forward to connecting and sharing my ideas for Google Apps for Education (GAFE) in the classroom again. I have always appreciated Google and everything it has done for me, but I have fallen head over heals in love with GAFE over the past two years as a new teacher. The ease of use and time-saving abilities of the suite of tools has done wonders for my teaching abilities. Tomorrow at 1:30 in Drapper II I will be presenting how I use GAFE in my Jr./Sr. High Language Arts classroom. Come share with me and let me know how you use GAFE in your classroom. Keep checking back this summer for more detailed ideas I have used. I promise (I'm making it public, hold me accountable!) to update more often and with more tools! On Monday I will be heading to the Blue River Cohort with several sister schools for a day of professional development before second semester starts (I can't believe it is second semester already!). I got a little crazy at the planning meeting for the day and signed up to present one session on my own and co-present two others. The session on my own is all about Apps and Extensions I use for the Chrome browser. Apps act like book marks for web pages and services you already use. Extensions help enhance the browsing experience you have on your webpages. Check out this Google Doc to see some of the Apps and Extensions I will be highlighting during the presenation. One of my favorite social media sites is Pinterest. It works as a great book marking tool for all things on the web. For me it allows for more organization and easier navigation than bookmarks in my browser. I have a personal gmail account, a work gmail account, a masters coursework gmail account, and my undergrad university email recently switched to gmail (I wonder who provides the best services!). I am regularly logged in to two different chrome accounts (work and personal) and browse for work material on both. If I stick with just book marks within my browser window, I have to copy and paste links from one window to the other to get book marks in the right place. This is a big hassle when I'm in a hurry and want to save something. I've tried other book marking systems in the past like Stumble Upon, Diigo and LiveBinders, but for me, Pinterest is the best. With the others managing and adding links is complicated and time consuming. With Pinterest, I downloaded a Chrome Extension for Pinterest for all my browsers and now when I find something I like, I simply click on the extension button to capture the page. I can select which pin board I would like the page attached to and from there add a description. I use Pinterest for education ideas, things around the house, recipes, and so much more. 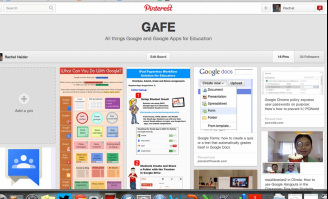 One of my favorite boards right now is my GAFE board where I am collecting all things Google and Google Apps for Education related. I pin articles and how-tos that I find myself as well as re-pin posts from other educators and technology specialists I follow on Pinterest. Since Google+ was made available to GAFE domains around November 2012, Google+ Hangouts have become a favorite of mine. But even better are Google+ Hangouts On Air. These two tools act similarly to video conferencing programs like Skype or Facetime, but with many added features. I know Skype has added the ability to connect with more than two people per call, but Hangouts let you connect 10 people for regular Gmail accounts or 15 connections using a GAFE domain account; that is a lot of opportunity for making connections for students in the classroom and for professional development for me as an instructor! The difference between a regular Hangout and a Hangout on Air is the ability for the latter to be recorded and then instantly uploaded to the linked YouTube account of the person who started the Hangout. By far one of the easiest ways to get content posted to YouTube. Each type of Hangout has its purpose. I love these two features of GAFE because as a digital learner, like many of my students, I am drawn to tools that help me make visual connections to the people I interact with. People who in the past were just an email address or too far away to make travel for “in person” interactions viable. Below are just a few of the ways I have used hangouts over the last few months. Sometimes instructions for assignments are a little complicated or I don’t have a substitute trained in English education when I am slated to be away from school. Rather than pass out stacks of worksheets that accomplish little to nothing, I have students do exactly what they would if I were at school. I have used Hangouts on Air to record myself walking through the assignment for my students, sharing my computer screen to highlight key elements of an electronic document they have access to through Google Drive. While the video above is not an actual sub video I have recorded, it is an example of me using a Hangout on Air to explain a concept, in this case a list of blogs that I started following for a Masters class. I simply started a Hangout on Air without inviting anyone to join me, pressed “Start Broadcast”, recorded my video, ended the broadcast, and finally hung up the Hangout. Once the Hangout ended the recording took just a few minutes to upload to my YouTube channel. For sub videos, once I have the link to the video, I post it three places: to the document shared with my students, in my sub plans, and if I know my substitute’s email, I will email it to him or her for easy use in class. Hangouts are also ways to connect students in different classrooms. For World Read Aloud Day 2013 I joined with the elementary principal in my district to create connections between the high school students and elementary students to promote literacy in our district. As a combined district some of our elementary students are in a town 15 miles away, but we didn’t want to leave them out of the celebration. Instead of taking time out of the day's activities to travel between schools, we decided on a Google Hangout to share some reading time between seniors and students in our 3rd and 4th grade classes. Hangouts are also great places for professional development for educators. During a #nebedchat Twitter chat on Flipped Education one Wednesday night back in February 2013, another educator and myself started discussing how flipping a Language Arts classroom would work. We soon realized this was not a conversation for 140 characters! And monthly Language Arts Hangout was born out of that interaction. Every second Tuesday of the month several Language Arts teachers from all parts of Nebraska get together to discuss issues specific to the Language Arts classroom. It has been a great tool to bounce ideas off of each other and figure out what is and isn’t working in the Language Arts classroom across the state. We record the conversation using Hangouts on Air so that if others miss the chat they can still come back and watch if they want. This is a picture of me one night during Spring finals week 2013. I gave my fist test using Google Forms the last week of school! For the most part the test itself went off without a hitch, it seemed as if one student lost his work during the test, but he clicked back a few times and got the answers to appear again. One student clicked off of the submission page too quickly and his test was actually lost; thankfully when he went to retake it the next day auto-complete was functioning in his browser. He soon realized if he tried every letter of the alphabet in each box, he could find his answers. The big issue came when it was time to grade the tests. My form became so large it wouldn't display the answer spreadsheet within the screen of my 13" laptop, so I had to open the spreadsheet on my 47" TV hooked to our desktop computer at home! The really cool thing for me was seeing numerous sheets of paper saved by not printing out 27 short answer tests about the writing process and techniques for research papers. It also saved time by not having to decipher student handwriting during an already busy time at school. Students were happy because they got to type their answers like they were used to doing and the test was something new they had never experienced before. The only part of test taking through the form I wasn't happy with was not having a test to hand back to students to check their answers. For this test it wasn't quite a big of a deal since it was the end of the year, but in the future it would be an issue. In talking with a colleague, we think there is a script you can apply to the form during creation to have a copy of answers sent to a student. Test review could happen this way, if I sent an email with questions students answered incorrectly. Overall a great first experience! As I find more and more creative ways of using GAFE in my classroom, I will post those uses for you to explore. If you have questions, contact my via one of the social media tools at the top or visit the About Me page to send me a question or comment.